(Copy Job [copying file 1, copying file 2], Verify Job [verifying file 1, verifying file 2]). This leads to several improvements for the transparency of the copy and verification process in Silverstack that are outlined in this article. The default verification behavior contains reduced options for the user. It is referred to as “Included in Copy Job” as the verification process happens file per file. It always verifies all destinations and the source (“Verify All Destinations, Include Source Verification”), therefore reduces options and makes sure the highest possible security is maintained. The advanced verification behavior “Separate (per Job)” allows to complete the copy of all files first and verify them later. It is referred to as “Separate (per Job)” as it creates a separate copy and verify job. Using the “Separate (per Job)” verification behavior, there are multiple options to choose from for the verification coverage. The verification coverage refers to the extent of verification that is performed. … and also the copy source. Abstract: Still secure for destinations, but neglects the detection of source problems possible with “Source Verification”. but does not verify the copy source. Abstract: No security, use with care! Only the size of copied files on destination is checked against the original. No verify job is created. File size check is performed with copy job. Even if it will not be verified, Silverstack creates a checksum during the copy process that is stored in the library. Checksum Method is fixed to xxHash to avoid limiting copy speed e.g. using MD 5 as checksum method. The first two selections for verification coverage have an additional option to suspend the created verify job (see also fig.2). This allows all other offload and copy jobs to be executed before the verification. The verify job suspends automatically once scheduled, and has to be resumed manually by the user. Learn more about “Source Verification” in the article Checksum Verification Methods. “Source Verification” or “verifying the source” refers to the process of reading the source once more after the copy process end as part of the verification process. This is done additionally to reading the destinations again to verify their checksums. The intention to do this is to make sure that the checksum still matches the one created during the initial read of the file for the copy process to detect e.g. broken source cards. The verification of the destination remains untouched by this setting. More information about cascading copy can be found in the article Cascading Copy. Overwrite existing files: This option allows to overwrite already existing copies on the destination(s). Skip Copy Step: The option to skip the copy step and only ingest material has been removed in the Offload wizard to clearly separate the copy from the ingest functionality. 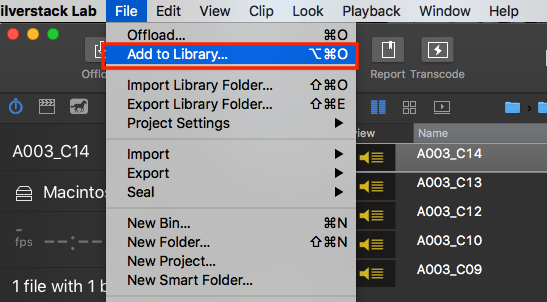 To ingest material without copying use the “Add to Library…” entry in the “File” menu. The Offload wizard allows to schedule jobs in the queue to be executed next, after the running job finishes. The default behavior, to add the job to the queue, will be restored after each copy job, as this is a hit and run choice before starting the jobs. Learn more about reordering of jobs with drag & drop in the article Reordering and Suspension of Jobs.